Belinda Kong's research focuses on contemporary literature by Chinese Diaspora and Asian American writers, with special attention to geopolitics, biopolitics, and state power. Her first book, Tiananmen Fictions Outside the Square, analyzes Chinese diasporic fictions on the 1989 Tiananmen movement and massacre. Her current book project examines global pandemic discourses around the 2003 SARS epidemic. 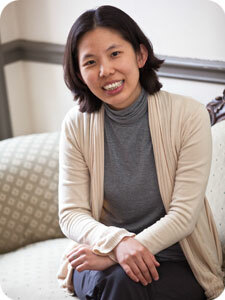 Her teaching areas include Asian American literature, Asian Diaspora literature, Chinese and Chinese Diaspora literature. Tiananmen Fictions Outside the Square: The Chinese Literary Diaspora and the Politics of Global Culture. Philadelphia: Temple University Press (Asian American History & Culture Series), 2012. “Xiaolu Guo and the Contemporary Chinese Anglophone Novel.” Oxford Handbook of Modern Chinese Literatures. Ed. Carlos Rojas and Andrea Bachner. Oxford: Oxford University Press, 2016. 474-497. “Diasporic Exceptionality: Maxine Hong Kingston’s ‘The Brother in Vietnam’ and Ha Jin’s ‘A Good Fall.’” Between Worlds: An Anthology of Contemporary Fiction and Criticism. Ed. Deborah Poe and Ama Wattley. New York: Peter Lang, 2012. 203-214. “In and Out of the Spectacle: The Beijing Olympics and Yiyun Li’s The Vagrants.” Ariel 42.1 (2011): 107-128. “Beyond K’s Specter: Chang-rae Lee’s A Gesture Life, Comfort Women Testimonies, and Asian American Transnational Aesthetics.” Journal of Transnational American Studies 3.1 (2011): 1-29. “Monkey Remnants: Paternality, Ancestry, and Chineseness in Patricia Chao’s The Monkey King.” Myth and Violence in the Contemporary Female Text: New Cassandras. Ed. Sanja Bahun-Radunovic and V. G. Julie Rajan. Burlington, VT: Ashgate, 2011. 37-54. “Theorizing the Hyphen’s Afterlife in Post-Tiananmen Asian-America.” Modern Fiction Studies 56.1 (2010): 136-159. “When Ghosts Dream: Immigrant Desire in Lan Samantha Chang’s Hunger.” Death in American Texts and Performances: Corpses, Ghosts, and the Reanimated Dead. Ed. Lisa K. Perdigao and Mark Pizzato. Burlington, VT: Ashgate, 2010. 99-112. “Shanghai Biopolitans: Wartime Colonial Cosmopolis in Eileen Chang’s Love in a Fallen City and J. G. Ballard’s Empire of the Sun.” Journal of Narrative Theory 39.3 (2009): 280-304. “The Asian-American Hyphen Goes Gothic: Ghosts and Doubles in Maxine Hong Kingston and lê thi diem thúy.” Asian Gothic: Essays on Literature, Film and Anime. Ed. Andrew Hock Soon Ng. Jefferson, NC: McFarland, 2008. 123-139. “Traveling Man, Traveling Culture: Death of a Salesman and Post-Mao Chinese Theater.” Arthur Miller’s Global Theater. Ed. Enoch Brater. Ann Arbor: University of Michigan Press, 2007. 35-56. “Kingston, Maxine Hong.” The Encyclopedia of Postcolonial Studies. Ed. Sangeeta Ray, Henry Schwarz, José Luis Villacañas Berlanga, Alberto Moreiras, and April Shemak Boston: Wiley-Blackwell, 2016. Blackwell Reference Online. Review of Not Like a Native Speaker: On Languaging as a Postcolonial Experience, by Rey Chow. CLEAR: Chinese Literature: Essays, Articles, Reviews 37 (2015). Review of Pluralist Universalism: An Asian Americanist Critique of U.S. and Chinese Multiculturalisms,by Wen Jin. American Studies 58 (2014): 222-223.
Review of Chinese Modernity and Global Biopolitics: Studies in Literature and Visual Culture, by Sheldon H. Lu. China Review International 18.4 (2013): 533-535. “Hong Kong (Britain/China).” Cultural Sociology of the Middle East, Asia, and Africa: An Encyclopedia. Vol. 3. Ed. Edward Ramsamy, Andrea L. Stanton, Peter J. Seybolt, and Carolyn Elliott. Thousand Oaks, CA: Sage, 2012. 288-290. "Anglophone Chinese Literature: The Case of Xiaolu Guo"
Duke University, Raleigh, NC. April. "Fleshing Out the Future: Speculative Fictions of China's Biocapitalism in Chan Koonchung's The Fat Years and Xiaolu Guo's UFO in Her Eyes"
Seminar organizer for "Asian Biocapitals"
"Theorizing Biocapital: Why Asia? Why Literature?" NYU, New York, NY. March. "'American Asia' in Ha Jin's Nanjing Requiem: Asian American Literary Politics as Comparative Empire Studies"
Seminar co-organizer for "Islands of Contention"
"Islands with No Texts: the Case of Diaoyu/Senkaku Islands"
University of Toronto, Toronto, Canada. April. "Playing Up the Past, Playing Down the Clock: Shanghai in Post-SARS Hong Kong Cinema"
Seminar co-organizer for "Discontemporaries: Turning Over and Overturning the Present"
"Crossed Objects Part 1: Timothy Mo's An Insular Possession"
Brown University, Providence, RI. March. "Tiananmen Fictions Outside the Square: Ha Jin and the Cultural Politics of Diaspora Literature"
Penn State University, University Park, PA. November. "Theorizing the Hyphen's Afterlife in Post-Tiananmen Asian-America"
"The Cangue of Cosmopolitanism: Eileen Chang’s Self-Translations"
"Yiyun Li's Aging of Globalization"
"Shanghai Biopolitans: Wartime Colonial Cosmopolis in Eileen Chang and J. G. Ballard"
Harvard University, Cambridge, Massachusetts. March. "The Afterlife of Polis: Walter Benjamin and the Chinese Diaspora"
"Asian American Afterlife: Theorizing the Ethics of Diasporic Writing"
"Ghosts and Doubles: The Asian-American Hyphen Goes Gothic"
"Writing the Trauma of the Other in Chang-rae Lee's A Gesture Life"
"The Two Gaos: Exile, Recognition, and the Manufacture of Literary Identity." At the Edge: Margins, Frontiers, Initiatives in Literature and Culture. International Comparative Literature Association 17th Congress. Lingnan University, Hong Kong, China. "The Ecstasy of Diasporic Homecomings." Imagining Diasporas: Space, Identity and Social Change Conference. University of Windsor, Windsor, Ontario, Canada. "Ha Jin and the Gradient of Difference." The University: 45th Annual Midwest Modern Language Association Convention. "Traveling Man, Traveling Culture: Arthur Miller and Death of a Salesman in Beijing." Caribbean Crossings: American Comparative Literature Association Annual Conference. Universidad de Puerto Rico, Rio Piedras, San Juan, Puerto Rico.